A few years ago I watched a documentary about the DARPA Grand Challenge. The documentary really affected me, and I have since thought a great deal about the implications of self-driving cars. Since my first introduction to self-driving cars, I have had the opportunity to move to Silicon Valley, and I now work right down the street from where Google's self-driving cars are being developed. I see them almost every day (I saw two on my way home from work yesterday). Right now, automated automobiles may seem like science fiction, but they are already out there. Google's self-driving cars have logged hundreds of thousands of miles, and Nissan and Mercedes are planning on having self-driving cars hit the road by 2020[2, 3]. To put that into perspective, more time has passed since Cars hit the big screen than we will have to wait for self-driving cars to hit the road. What will the road be like when all cars drive themselves? This is what I think. I never really cared about traffic until I moved to the Bay Area. Living in Las Vegas and Utah, getting stuck in traffic was very rare for me—not often enough for me to really give it much thought. Now, I spend close to an hour stuck in traffic every day I drive to work (I ride my bike about half the time). The cost of traffic in the US (measured as wasted fuel and lost productivity) was $120 billion in 2012. I think about traffic a lot now, and I can see (and feel) that this is a major problem. Cars driven by computers can drive with machine precision, which means they can drive closer to each other, which means that we can add a few more lanes to every road without making the roads any wider. Computers don't cut off other computers, or drive distracted, or follow too closely, or brake harder than is necessary, or change lanes unnecessarily, or run into each other. The major causes of traffic would be eliminated. Additionally, cars could organize themselves into platoons to imporve efficiency by reducing air resistance and increasing road capacity and throughput. When all cars are automated, there will be no need for stoplights. As a car approaches an intersection, the intersection could take control of the car. If it is safe to go through without slowing, that's what will happen. If the car needs to slow to avoid collisions with other cars, or stop to let a pedestrian or cyclist pass, that's what will happen. For everyone who has sat alone for several minutes waiting at a red light, this is an amazing prospect. Imagine this. Your car drives you to work, then drops you off at the front door. You hop out (no tip necessary), and the car drives away. Where does it go? Well, that depends. If you're just commuting, you don't really need to own the car, so the car might drive away and pick someone else up. If you do need to own the car (if you have kids, you probably need to own your car), the car finds available parking nearby. When you're ready to go, your car (or a nearby available car) comes to pick you up. No more parallel parking! Just to reiterate, in case you missed it, you probably don't need to own a car. You can have all of the benefits of owning a car (and then some), without all the hassle of ownership. It's like zipcar, but better. Two weeks ago I was riding my bike home from work and a car pulled out right in front of me, leaving me no time to stop. I broke my leg, and I won't be able to bike or drive for a long time. I am dependent on others for almost everything. I am very fortunate that all I broke was my leg. In 2011, 677 cyclists and 4,432 pedestrians were killed in collisions with motor vehicles[5, 6]. In my case, the driver just didn't look before he entered my lane. Self-driving cars may not prevent every collision with cyclists and pedestrians, but they would prevent most. They would have prevented mine. Self-driving cars have sensors all over. There are no blind spots, and they see in all directions at the same time. I can't say that there would never be another collision between cars, but they would certainly be a rarity. When people aren't driving, they can't drive drunk, or distracted, or angry. No more DUI's, texting deaths, or road rage related shootings. In fact, no more speeding tickets or parking tickets, either. 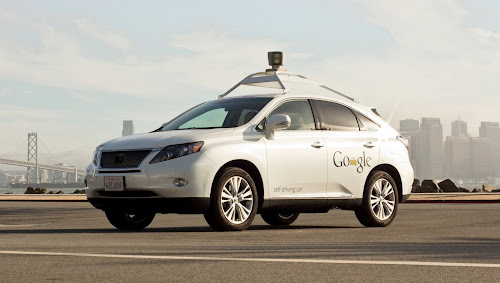 The idea of self-driving cars has interested me for years. My collision two weeks ago has significantly strengthened that interest. I won't stop riding my bike (I actually don't have a bike right now. The one I had broke in half), but I'm going to do what I can to make the road safer for everyone. I am starting by taking Udacity's Artificial Intelligence for Robotics course, taught by Sebastian Thrun, the man behind Stanford's winning DARPA Grand Challenge car, Stanley, and the Google Self-Driving cars. Self-driving cars will change the world for the better.